Minsk, Belarus — One of the questions I was repeatedly asked during a recent trip to the capital of Belarus was whether the Obama administration would opt for greater pragmatism at the expense of idealism in foreign policy. Both the government and opposition in this country have a vested interest in the answer. As early as next week, the U.S. will decide whether or not to continue sanctions against the country known as “Europe’s last dictatorship.” The European Union faces fresh choices as well. NATO sees Belarus as a potential threat to neighboring Lithuania. Russian tanks stationed in Belarus can be in the Lithuanian capital, Vilnius, in about 90 minutes. This small nation of 10 million can threaten in other ways: 20% of EU gas imports from Russia pass through the former Soviet state. Belarus also remains a notorious human-rights abuser. In its press-freedom index, Freedom House ranks Belarus 188th out of 195 countries. Transparency International rates Minsk as more corrupt than Moscow. Minsk can feel like a time warp: Main avenues in the capital are still named after Lenin, Marx and Engels. On my trip, I attended a dinner with leading oppositionists in a private room at a local restaurant. It was private except for the two minders who were stationed about five feet away from us. At a meeting of former political prisoners at the U.S. embassy to celebrate the 55th anniversary of Radio Liberty broadcasts to Belarus, I met a former trade minister who had served two years for breaking with the regime. Another young, charismatic businessman had spent six years behind bars for his pro-opposition views. The man who rules Belarus, Alexander Lukashenko, is severe. In 1995 he had his air force shoot down a hot air balloon that had strayed into his air space, killing two Americans. The U.S. and the EU need to consider two issues in their relations with Belarus. It’s only through a coordinated approach that we’ll make progress towards reform. The first issue has to do with democratic development. The heady days of the 1990s, when it appeared that freedom was on the march around the world, have given way to a decade of democracy recession. The most troubling developments have taken place in Russia and its periphery. Democratization in countries such as Belarus, Georgia and Ukraine will almost certainly help to curb Russia’s imperial appetite. Faced with neighboring democracies, Russia would be forced to take greater stock of its affairs at home. Garry Kasparov, the chess champion turned Putin opponent, thinks of an inside and an outside game if you want to support Russian democracy today. Mr. Kasparov argues that the outside game — what happens in Russia’s neighborhood — may be as important as what’s happening inside Russia. Let’s encircle Russia with states that provide a powerful model for democratization. It has been 20 years since George H.W. Bush gave his “Europe, Whole and Free” speech in Mainz, Germany, and the project is only half complete. Second, the prospects for political change in Belarus may not be as bleak as some believe. True, the opposition is weak. For his part, Mr. Lukashenko never fails to disappoint. Despite all evidence to the contrary, the regime calls into question the fact that the mass graves on the outskirts of Minsk are the work of Stalin’s henchmen. And Mr. Lukashenko is the only ex-Soviet leader to have proudly retained the name “KGB” for his security services. Yet every dictator has his Achilles’ heel. For the authorities in Belarus, theirs may be the economy. The Russians, with whom Mr. Lukashenko has a “close but dysfunctional relationship,” as one EU diplomat puts it, have reduced their economic support for Belarus in the last couple of years. Moreover, Belarus has not managed to remain immune from the global financial crisis. According to that same diplomat, some 25% of state-enterprise employees are now working on reduced hours. Mr. Lukashenko is in trouble if his social pact begins to seriously fray. What to do? The civil-society leaders I met were in agreement that the recent release of political prisoners was the result of U.S. and EU pressure. That pressure must be sustained. The U.S. should consider lifting sanctions only on the basis of strict conditionality. Washington should not give in to the temptation to accept the return of the American ambassador, who was expelled last March over U.S. sanctions, as sufficient. Belarus must be pressured to have more independent media, to investigate the cases of missing dissidents, and to end the practice of jailing oppositionists. For its part, the EU should insist that any economic assistance be closely tied to political reforms and respect for human rights. This will be slow, tough going to be sure. But now is exactly the wrong time for a short-sighted realpolitik approach. Source: The Wall Street Journal of 29 May 2009, page A13. The Washington-based International Women’s Media Foundation awarded a 2009 Courage in Journalism Award to Iryna Khalip, a Belarusian journalist who is frequently detained and subjected to all-night interrogations by police. 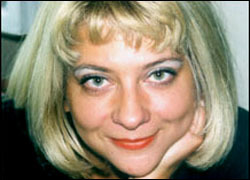 Iryna Khalip, 41, reporter and editor in the Minsk bureau of Novaya Gazeta. For more than 15 years, Khalip has been a journalist in Belarus, considered to be of the most oppressive countries toward journalists in the world. After working at a succession of newspapers, only to see them closed by the government, she now works for Novaya Gazeta, one of the most independent newspapers in the former Soviet Union, and the newspaper of 2002 Courage Award winner Anna Politkovskaya, who was murdered in 2006. Created in 1990, the IWMF Courage in Journalism Awards honor women journalists who have shown extraordinary strength of character and integrity while reporting the news under dangerous or difficult circumstances. The Lifetime Achievement Award recognizes a woman journalist who has a pioneering spirit and whose determination has paved the way for women in the news media. Including this year’s award winners, 66 journalists have won Courage Awards and 18 journalists have been honored with Lifetime Achievement Awards. The 2009 awards will be presented at ceremonies in New York on October 20 and in Los Angeles on October 28.